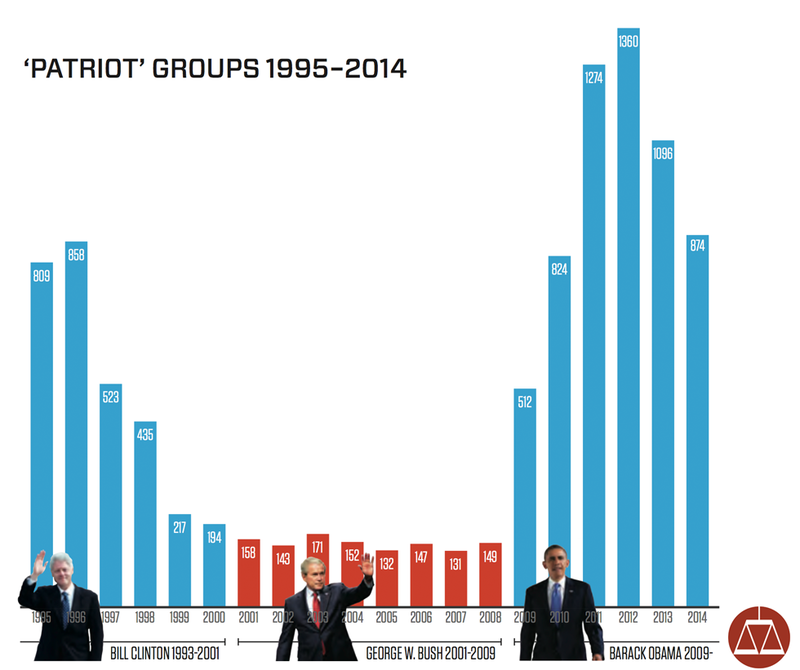 The so-called “Patriot” or militia movement, which hit the United States in two waves cresting in the 1994-2000 period and again beginning in 2009, is animated by conspiracy theories about the federal government and its alleged intentions to merge the country into a global government ruled by dictatorial, socialistic elites. Although there are many important dates and extremist crimes associated with this movement, the timeline that follows emphasizes Patriot resistance to the federal government, in particular over land use and related issues that came to the fore with the April 2014 Nevada standoff between federal agents and rancher Cliven Bundy, who refused to pay over $1 million in accumulated federal grazing fees. An armed uprising begins in Pennsylvania in response to the new federal government’s attempt to impose taxes on whiskey, widely used by poor farmers as a form of currency. What comes to be known as the Whiskey Rebellion collapses after President George Washington marches troops into Pennsylvania. The conflict helps to strengthen the still very shaky authority of the federal government. Vice President John C. Calhoun, who is one of Southern slavery’s most vociferous defenders, writes “The South Carolina Exposition and Protest,” challenging a federal tariff that favors the North. In it, Calhoun promotes nullification, the idea that states can ignore any federal law that goes beyond powers explicitly granted the federal government by the Constitution. The doctrine, which will later be rejected by the courts, will be used to defend slavery and segregation and still forms the basis for many far-right attacks on federal power today. Although slavery is the chief cause of the Civil War, not states’ rights, the war and its aftermath (Reconstruction and the military occupation of the former Confederate states) have the effect of greatly strengthening the federal government. The legacy of federal power inherited from the Civil War is bolstered by the government’s growing role in defending black Americans during the civil rights movement that begins with the Brown v. Board of Education desegregation ruling and ends with the assassination of Martin Luther King Jr. The association of the American far right with local versus federal power becomes explicit. A leading racist and anti-Semitic activist, Gale issues the manifesto that will form the basis of the Posse Comitatus, a radical group that will develop some of the key doctrines of the radical right for decades to come, including county supremacy. In his "Guide for Volunteer Christian Posses," Gale says the Posse should deal with government officials who “disobey” the Constitution by taking them “to a populated intersection of streets… at high noon [to] be hung there by the neck.” Gale issues the first chapter charters for the Posse the following year. The chairman of the Klamath County, Ore., Posse Comitatus chapter writes state legislators threatening to have them tried for treason if they refuse to repeal an important conservation measure. Congress passes the Federal Land Policy and Management Act, generally seen as provoking the Sagebrush Rebellion. The act ends the historic American practice of homesteading, leaving huge swaths of public lands in the West under the control of a variety of federal agencies including the Bureau of Land Management (BLM). The Sagebrush rebels, who include Ronald Reagan, seek state or local control of federal lands and also reductions in cattle grazing permit fees. The movement dies off in the 1980s after courts rule that the lands are legally under federal control. Two federal marshals are murdered by North Dakota farmer and Posse activist Gordon Kahl when they try to arrest him for criminal refusal to pay taxes, a leading issue for the Posse. Kahl escapes and evades arrest for four months, traveling through a network of safe houses, before dying four months later in an Arkansas shootout in which he first kills a local sheriff. The Illinois Supreme Court strikes down the use of “land patents,” a bogus technique promoted by the Posse to erase farmers’ debts. A conference organized by timber lobbyist and anti-environmental activist Ron Arnold kicks off what becomes known as the Wise Use movement, essentially an extension of the earlier Sagebrush Rebellion. The movement, largely funded by resource extraction industries, seeks to expand private property rights and drastically reduce environmental regulation of public lands. President Bush, describing the post-Cold War world, outlines his vision of a “New World Order.” Conspiracy-minded Patriots take this as confirmation of secret plans to create a one-world government. Radical officials in Catron County, N.M., pass a total of 21 ordinances meant to supersede federal authority over public lands. Among other things, the laws define federal grazing permits as private property — not a public service offered by the federal government — just as many Bundy supporters will two decades later. Local county politicians warn of “civil war” if the government doesn’t back off, with one specifically warning of violence if ranchers’ cattle are seized. At the United Nations’ so-called “Earth Summit” in Rio de Janeiro, Brazil, President George H.W. Bush and the leaders of 177 other nations sign Agenda 21, a sustainability planning document. Although the document is completely nonbinding and contains no requirements or enforcement mechanisms, it will come under attack from the John Birch Society and many other Patriot organizations that claim it is an effort, hidden in the guise of environmentalism, to impose socialism and eradicate property rights in the United States. White supremacist Randy Weaver surrenders after an 11-day standoff at his cabin on Ruby Ridge, Idaho, that left his wife, son and a U.S. marshal dead. The incident, which began after Weaver refused to go to court on illegal weapons charges, galvanizes many on the radical right, who see it as proof that the federal officials will murder those who oppose their growing power. Anti-Semitic Christian Identity pastor Pete Peters hosts the "Rocky Mountain Rendezvous" in Estes Park, Colo., where 160 extremists, reacting to Ruby Ridge, lay out strategies that will help shape the militia movement. Four federal agents and several cultists are killed in a gunfight when the Bureau of Alcohol, Tobacco and Firearms raids the Branch Davidian compound in Waco, Texas, over illegal weapons charges. The 51-day standoff that follows rivets the nation. Most on the radical right see the Davidians as heroes standing up to federal oppression and unjust gun laws. The FBI tries to end the Waco standoff by injecting tear gas into a building that subsequently bursts into flames, leaving almost 80 Davidians dead. More than any other event, the debacle ignites the militia movement. A bomb is tossed on to the roof of the state Bureau of Land Management headquarters in Reno, Nev., amid disputes over federal power in the West. The Brady Bill, imposing a waiting period for handgun purchasers, is signed into law, infuriating many gun enthusiasts. Anger at the bill, along with a 1994 ban on some assault weapons, helps fuel the coming militia movement. Richard Mack, a radical Arizona sheriff and county supremacist who in 2014 will travel to the Bundy ranch, joins others in suing the government over the Brady Bill, eventually winning a weakening of its background check provisions. Starting this year, at least 20 state legislatures consider or pass resolutions supporting states’ rights and condemning the federal government. Many cite the 10th Amendment, which declares that powers not reserved to the federal government belong to the states. Some states use the 10th Amendment in failed attempts to evade environmental, labor and other kinds of federal regulations. 10th Amendment advocates and militiamen in the West, angered by President Bill Clinton’s attempts to enforce environmental law, increasingly demonize federal agencies like the BLM, the U.S. Forest Service, the U.S. Fish and Wildlife Service and the National Park Service, leading to fistfights, death threats and bombings. The first major modern militia, the Militia of Montana, is officially inaugurated by white supremacist John Trochmann. Nye County, Nev., County Commissioner Richard Carver, backed by armed supporters, illegally bulldozes open a National Forest road that had been ordered closed, later boasting that if federal forest rangers had resisted they would have been shot. The action is later dubbed Sagebrush II. A militiaman threatens an Audubon Society official with a noose after the official testifies for an environmental measure. The incident is one of hundreds reflecting Patriot hatred of regulation of the environment. Bureau of Land Management officials tell their employees not to resist if they are arrested, even unlawfully, by local officials espousing county supremacy. Idaho BLM director issues a memo on “County Supremacy Movement Safety Guidance.” The U.S. Forest Service tells workers they don’t have to wear their uniforms or drive government vehicles if they feel endangered by local activists. Reacting to a federal court order closing six national forests to logging, grazing and mining, an Idaho militia leader threatens “blood in the streets” if the order is not rescinded. A truck bomb brings down the Oklahoma City federal building, killing 168 people, including 19 small children in a day-care center, in America's worst domestic terrorist attack. Timothy McVeigh, later convicted in the bombing, was angered by the federal government’s actions in Waco and elsewhere. A bomb destroys a van belonging to a Forest Service ranger whose Carson City office was bombed four months earlier. Ranger Guy Pence is not at home when the bombing occurs in his driveway, but his family is. Due to a spike in threats from "sovereign citizens" and others against federal judges and prosecutors, the U.S. Marshals Service opens a clearinghouse near Washington, D.C., for assessing risks. In fiscal 2008, there will be 1,278 threats and harassing communications — more than double the number of six years earlier. Also in 2008, the Department of Justice launches a National Tax Defier Initiative to address the swelling number of cases involving antigovernment tax protesters. The Oath Keepers, a Patriot group made up mostly of active-duty members of law enforcement and the military, holds its first muster in Lexington, Mass., site of the opening shots of the Revolutionary War. Vowing to fulfill the oaths to the Constitution that they swore, Oath Keepers lists 10 orders its members won't obey, including two that reference U.S. concentration camps — a reflection of the group's conspiracist ideas about a supposedly imminent globalist takeover. The group’s leader, Stewart Rhodes, will later travel with followers to Bundy’s ranch. Some 30 "freedom keepers" meet in Jekyll Island, Ga., in a gathering that helps launch an explosive resurgence of the Patriot movement. Convened by IRS- and Fed-hater Bob Schulz, the conclave warns of "increasing national instability" and a coming New World Order. More than 100 delegates from 48 states travel to St. Charles, Ill., to attend an 11-day "continental congress" hosted by Bob Schulz's We the People. Planned at the earlier Jekyll Island meeting, the event is named after the gathering that was the first step toward the American Revolution. The Conservative Political Action Conference is co-sponsored by Patriot groups including the Oath Keepers and the John Birch Society, which once charged that President Dwight D. Eisenhower was a communist agent. The arrangement underlines the increasing influence of conspiracy-minded Patriot organizations and their propaganda in relatively mainstream right-wing circles. A CNN/Opinion Research Corporation poll finds that 56% of Americans believe the federal government is "so large and powerful that it poses an immediate threat to the rights and freedoms of ordinary citizens." In 1995, just days after the Oklahoma City bombing, a USA Today poll found that 39% of Americans then agreed with the same statement. Former Alabama militiaman Mike Vanderboegh, a leader of the recently formed Patriot group Three Percenters, calls on followers to protest health care reform by throwing bricks through the windows of local Democratic Party offices. In the following days, Democratic offices across the country report their windows smashed. Four years later, Vanderboegh will make his way to the Bundy standoff, where he is joined by other members of the Three Percenters. Patriot leaders including Richard Mack and Stewart Rhodes play prominent roles at a Second Amendment March in Washington, D.C. The Republican National Committee passes a resolution denouncing Agenda 21 as a “destructive and insidious scheme” to impose a “socialist/communist redistribution of wealth” on America, a completely unfounded view of the voluntary UN sustainability plan. The resolution reflects how deeply Patriot conspiracy theories about environmentalism have penetrated the political mainstream. The entire Baldwin County, Ala., Planning and Zoning Commission resigns in disgust after the local County Commission votes to rescind a local, prize-winning planning document based on Agenda 21. The County Commission’s killing of the plan, which was followed by a crowd singing “God Bless America,” is one of scores of cases of officials around the nation abandoning environmental planning efforts because of multiplying far-right attacks on Agenda 21. Gilberton Borough, Pa., passes an ordinance “nullifying all federal, state or local acts in violation of the Second Amendment.” The driving force behind the new law is local police chief Mark Kessler, a supporter of Richard Mack who later loses his job after an epithet-filled rant against “libtards” and Democrats. A confrontation between BLM and law enforcement personnel and Cliven Bundy and his supporters nearly ends in bloodshed as militia members and others point their weapons at the federal officers. The BLM backs down, calling off the roundup of Bundy’s cattle that precipitated the standoff. Federal officials say later that a criminal investigation of Bundy and his supporters is under way.